Litecoin is similar to Bitcoin in many ways, but it is quicker and cheaper. The same open source cryptographic protocol upon which Bitcoin was built was adopted by Charlie Lee, a former Google engineer, to build Litecoin. And while Bitcoin has soared and crashed often and grabbed media headlines in the process, Litecoin did not gain as much notoriety despite its rollercoaster price swings. Nevertheless, it was adopted by Coinbase, a leading digital currency exchange, as one of just a few cryptocurrencies available for purchase and sale by the general public. So, if Litecoin can be easily bought and sold by the general public and is faster and cheaper than Bitcoin, how will this affect its price? 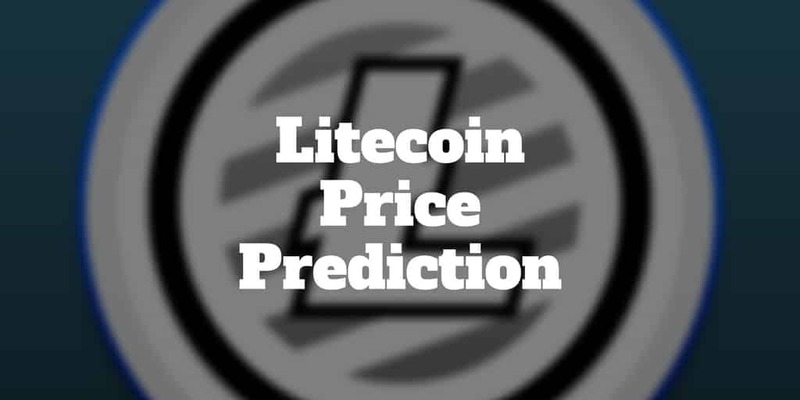 We examine Litecoin price predictions to see where it may be headed next. How Many Litecoins Will Exist? Litecoin Price Prediction: What Would Warren Buffett Say? Litecoin Price Prediction: What Would John McAfee Say? Every 4 years, the release of Litecoins halves, reaching a final total of 84 millions coins. By contrast, Bitcoin has a finite supply of just 21 million coins, which should all be mined by 2040. Research from Chainalysis has reported that as many as 3.79 million Bitcoins may already be lost forever. The results are based on empirical data from blockchain analysis in which all Bitcoin transactions are recorded. Chainalysis is no ordinary data analysis company. They have been so successful at studying blockchain wallets that they count Europol and Uncle Sam as clients. They have discovered that wallets associated with Bitcoin founder, Satoshi Nakamoto, hold about 1 million Bitcoins. And they assume these coins are gone forever, which may prove inaccurate over time. The reason it is important to know how many Bitcoins have been “lost” is because it provides a better insight into the true market capitalization of the cryptocurrency. The market cap is the market price of the cryptocurrency multiplied by the existing number of coins. And it’s valuable to know how many Bitcoins Satoshi Nakamoto has because if he decides to sell at some point in the future, the price of Bitcoin could plummet. In fact, in December 2017, Litecoin founder Charlie Lee did precisely that. He announced on Twitter that he had sold his entire stake of Litecoins (LTC). And while he defended his decision and claimed to still have full confidence in the cryptocurrency, the obvious interpretation is that when the founder sells his entire holdings, the coins may be overvalued. But is there any way to come up with a price prediction for Litecoin? Cryptocurrency skeptics argue that digital assets are not backed by any tangible asset like gold. Proponents counter-argue that the U.S. dollar is backed by nothing more than the faith and credit of the U.S. government. The reality is if a network of individuals have confidence in the future use of a cryptocurrency, it has the value ascribed to it. By using that logic, a market capitalization analysis can be conducted. The market cap of Litecoin can be compared with the “market cap” of other world currencies to analyze its share of market. If the price point of Litecoin is $300 and the supply of Litecoins in existence is 55 million coins, then the market capitalization would be equal to $16.5 billion. We know that the total number of Litecoins to be issued over time is 84 million, and at the same price point of $300 the Litecoin market capitalization would be $25.2 billion. Cryptocurrency critics argue that virtual coins are used by the same people who use cash to exchange goods and services. If we assume that is true for a moment then the we can compare the market capitalization of Litecoins to the number of U.S. dollar bills in circulation (as well as other paper currencies). It is estimated that 1.2 Trillion of U.S. dollar bills are floating around the world. So a $25.2 billion market capitalization of Litecoins would represent 2.1% of U.S. dollar notes and coins. When you factor in other fiat currencies that percentage drops significantly. However, Litecoin is just one of many cryptocurrencies in existence. By late 2017, the total market capitalization of all cryptocurrencies had risen to over $600 billion, approximately 50% of the value of all U.S. dollar notes and bills in circulation. That might seem like a lot until you view money supply through a slightly different lens. The total money supply is about 10 times greater than the supply of notes and bills in existence. So the market cap of cryptocurrencies is just 5% of total U.S. money supply by that definition. Advocates of cryptocurrencies argue that the market share of cryptocurrencies is small when you view them as a future potential replacement for paper bills and factor in all other currencies too, such as the Euro, Pound Sterling, Japanese Yen, and Swiss Franc. But are there other ways to calculate Litecoin price predictions beyond market capitalization? 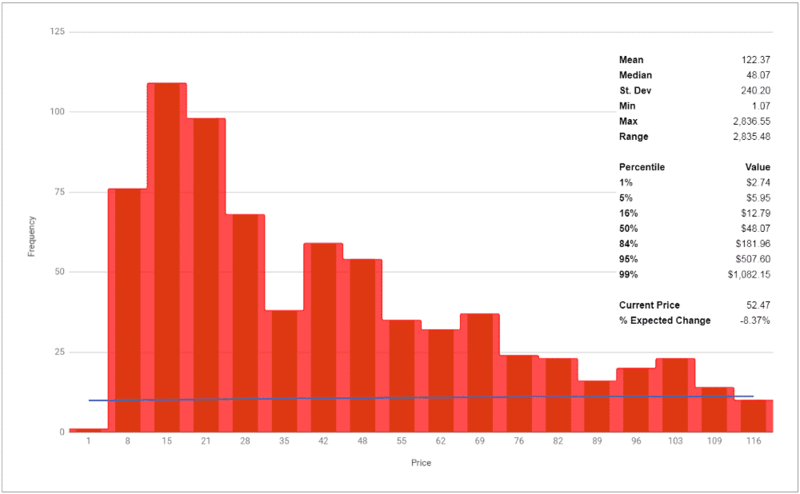 John Young conducted analysis of cryptocurrencies using Monte Carlo analysis. He used a multi-step process that involved gathering historical prices of Litecoins, calculating daily returns, naming the daily range, summarizing statistics, simulating a single year and multi-year timelines, evaluating multi-year statistics and analyzing the results. The model he used was geometric Brownian motion and the Litecoin price prediction for the year up to Nov 2018 was a price range from $6 to $507 with a mean of $122. Statistical whiz kids would argue that this is perfectly acceptable if you believe the underlying process is stationary and well behaved. Even then, the real world tends to produce fat tails that have a habit of causing models to blow up! 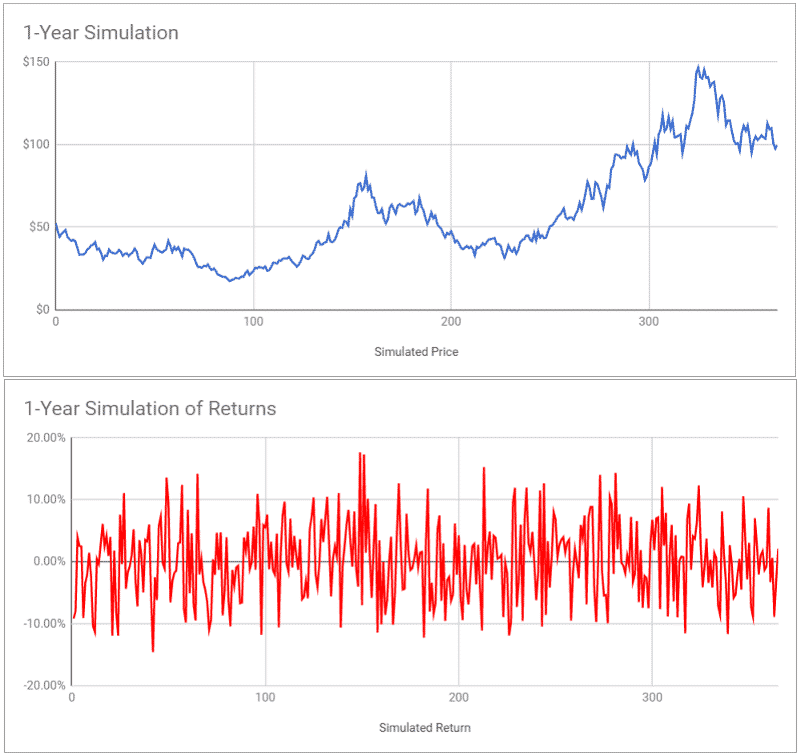 So Brownian motion may be common for modeling the progression of asset prices as a stochastic process with drift and a random Brownian term with changes most typically assumed to be either normally or lognormally distributed. But when it comes to cryptocurrencies with a short history that have prices characterized by flat-to-downward drifting price phases and exponential explosive growth spurts, it may not be the best choice. The vast price range Young arrives at is attributable to the fact that the model is calibrated to historical data. And it could be argued that a Litecoin price prediction range from $6 to $507 is not especially helpful in narrowing down a price point! Nevertheless, while it may be a sub-optimal tool to make a Litecoin price prediction, the reality is few good tools exist. And one of the reasons for significant price volatility in cryptocurrencies is precisely because no easy way exists to value them. > Related: Litecoin Vs Ethereum: Which Cryptocurrency Is Best? What Would Warren Buffett Say? Famed investor Warren Buffett wasn’t shy about making his opinions known about cryptocurrencies. Just like gold, Bitcoin, Litecoin, and other cryptocurrencies don’t produce dividends for investors. When a company issues a dividend, you can build a financial model that predicts into the future how much the company will earn in total and discount that back to calculate a present value for the company. But cryptocurrencies are only worth as much as some other investor will pay in the future. Buffett has historically argued that if you could buy all the gold in the world or all the real estate in the United States, you should choose the real estate because you can rent out the properties to tenants and earn a steady stream of income. However, gold and cryptocurrency values are based on the value another investor will pay you tomorrow. While Buffett’s arguments have merit, he also admitted to having missed out on Alphabet and Apple, leading technology companies. Indeed, he is famous for shunning technology companies because he doesn’t understand them. What Would John McAfee Say? By sharp contrast to Warren Buffett, John McAfee has argued that cryptocurrencies are a positive game-changer. He predicts Bitcoin will rise to a value of $1,000,000 per coin by 2020. That is a 50x increase over current prices for Bitcoin (at the time of writing). And if Litecoin were to rise by a commensurate amount, it would increase to approximately $15,000 per coin from around $300. Take that prediction with a pinch of salt because John McAfee is one of the biggest Bitcoin miners in the United States, so it is very much in his interests for the price of all cryptocurrencies to rise, especially Bitcoin. Arriving at a Litecoin price prediction is a difficult task. If you were to believe Warren Buffett’s argument that cryptocurrencies produce no dividends, you may be inclined to dismiss them altogether. However, if you were to follow the comments of John McAfee, one of the largest Bitcoin miners, you may believe a 50X increase in value is possible. According to Brownian motion models, the Litecoin price prediction range through November, 2018, is from $6 to $507 with 95% confidence. And while statistical wizards may argue that the model is wrong, it’s hard to find a better one. Even calculating the market share of cryptocurrencies relative to conventional currencies is challenging because assumptions have to be made about how much market share they can take and whether Litecoin will establish itself as prominently as Bitcoin and Ethereum. The bottom line is it’s nearly impossible to accurately arrive at a Litecoin price prediction forecast so any investments you make should be done in consultation with a financial advisor, and should be considered speculative. Do you trade cryptocurrencies? What is your Litecoin price prediction for the next year? >> Litecoin Vs Ethereum: Which Cryptocurrency Is Best?